After five years as a toy maker, Ayah Bdeir, the CEO of LittleBits, has unveiled her real vision: To make hardware prototyping as commonplace in design shops as using wood and cardboard to build models. To do this, LittleBits (see disclosure) has built a connected module called the Cloud Bit. It links up to the existing LittleBits modules of sensors and actuators to allow them online so they can control a web service, or so the physical bits can be controlled through the web. It allows someone to build an automated lock, or a goldfish feeder, or any number of other connected devices that are so popular today. 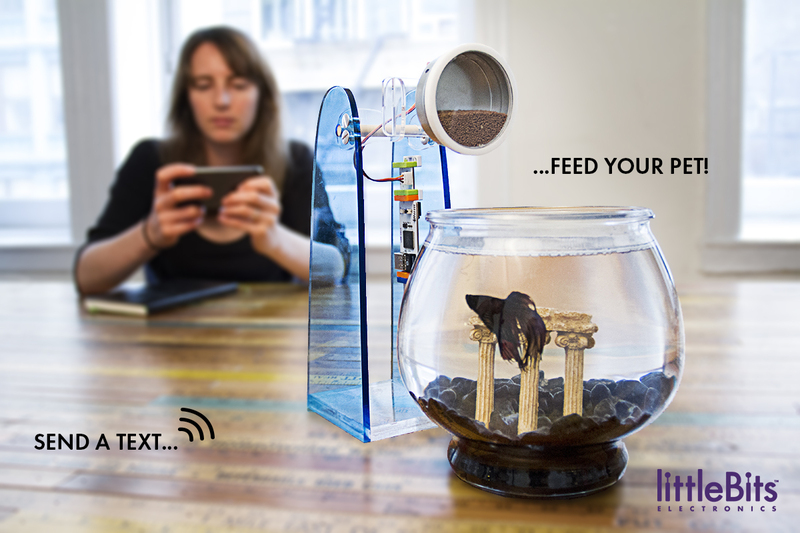 A fish feeder made with a LittleBits cloud bit. Some other hardware building blocks, like Arduino or Raspberry Pi, require coding and a shield or other element to get connectivity. The Electric Imp module also requires a bit of programming and hardware expertise. But the goal of LittleBits is to be so easy you never have to learn how to solder or cut and paste code. The CloudBit snaps together to the other bits and shows up on your phone, ready to control whatever it is connected to. So many little bits from LittleBits. The cloud bit will sell for $59 individually or as part of a $99 bundle. It links back up to a web service that LittleBits has built to support simple API calls and other web elements. The company also announced it will be in retail stores for the first time. LittleBits will be available at RadioShack stores across the country this fall as part of a collaboration between RadioShack Labs and fulfillment giant PCH. So now your destination for RC-controlled cars and batteries is now a place you can pick up some internet-age building materials and other fun connected devices. LittleBits is backed by True Ventures, a venture capital firm that is an investor in the parent company of Gigaom.